440 Marlborough is located on the south side of Marlborough, between Massachusetts Avenue and Charlesgate East, with 438 Marlborough to the east, and the rear of 393 Commonwealth to the west. 440 Marlborough was designed by architect Obed F. Smith and built in 1885-1886 by Charles H. Dodge, mason, for building contractor George Wheatland, Jr., for speculative sale, one of six contiguous houses (430-432-434-436-438-440 Marlborough), arranged in a symmetrical group, the three to the east (430-434 Marlborough) with bays on the eastern side, and the three to the west (436-440 Marlborough) with bays on the western side. The peaks of the bays have varied designs. George Wheatland, Jr., is shown as the owner on the original building permit for 440 Marlborough, dated October 16, 1885. At the same time, George Wheatland, Jr., was having six more houses built at 381-391 Commonwealth on the lots to the south, behind 430-440 Marlborough, also designed by Obed Smith and built by Charles Dodge. 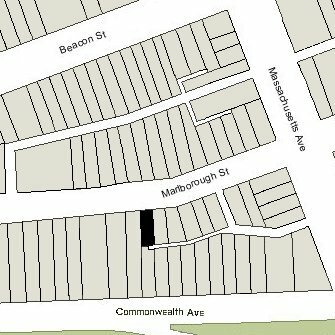 Click here for an index to the deeds for 440 Marlborough, and click here for further information on the land west of Massachusetts Avenue between the south side of Beacon and the north side of Commonwealth. On January 4, 1887, 440 Marlborough was purchased from George Wheatland, Jr., by wholesale lumber merchant Edward Jonathan Hammond. He and his wife, Alice Ida (Eastman) Hammond, made it their home. They previously had lived at 7 Columbus Square. At the same time as he purchased 440 Marlborough, Edward Hammond also purchased 438 Marlborough. He sold it one year later to Sarah A. (Garland) Kennard, the widow of Daniel Kennard. 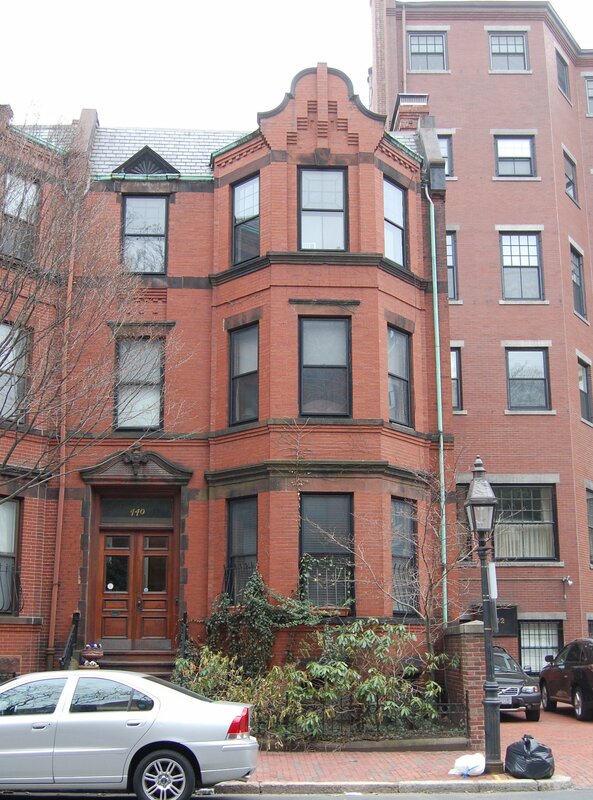 The Hammonds continued to live at 440 Marlborough during the 1895-1896 winter season, but moved thereafter to Brookline. 440 Marlborough was not listed in the 1897 Blue Book. On May 15, 1897, 440 Marlborough was purchased from Edward Hammond by Sarah Winslow (Howard) Pickering, the widow of Arthur Pickering. She previously had lived at 64 Dudley. Sarah Pickering’s son and daughter, Arthur Howard Pickering and Susan Howard Pickering, lived with her. Arthur Pickering was a teacher and a popular public reader, known for his recitations of poetry and works of literature. Also living with them was Sarah Pickering’s unmarried sister, Hepsie Swan Howard. Arthur Howard Pickering died in December of 1904 and Sarah Winslow Pickering died in March of 1907. In her will, Sarah Pickering left 440 Marlborough to her daughter, Susan Pickering, with a life tenancy to her sister, Hepsie Howard, to continue if she survived Susan Pickering. Susan Pickering and Hepsie Howard, continued to live at 440 Marlborough. They also maintained a home in York Harbor, Maine. Hepsie Howard died in April of 1917. Susan Pickering continued to live at 440 Marlborough during the 1934-1935 winter season, but moved thereafter. On January 14, 1936, 440 Marlborough was purchased from Susan Pickering by Alexandra (Palmer) deGerard, wife of Victor Michel deGerard. They lived at 14 Brimmer. Victor deGerard was an insurance broker and also was an instructor in Slavic languages at Harvard. 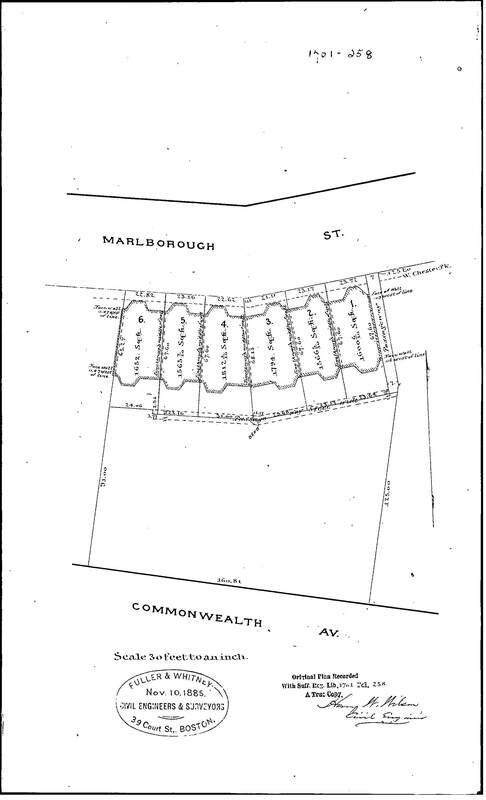 On April 30, 1936, 440 Marlborough was acquired from Alexandra deGerard by Susan (Tobin) Dolan, the wife of Thomas C. Dolan, a building contractor. They previously had lived at 465 Commonwealth. On January 8, 1946, Susan Dolan transferred 440 Marlborough to her brother-in-law, Rev. Bertrand Charles Dolan, and on January 10, 1948, he transferred the property to the Order of Saint Benedict of New Hampshire. The Dolans continued to live at 440 Marlborough until their deaths, hers in October of 1949 and his in April of 1950. On January 5, 1953, 440 Marlborough was acquired from the Order of Saint Benedict by Miss Louise T. Clark, a teacher. She lived there with her mother, Rachel (Dickson) Clark, the widow of James Clark, and on January 21, 1953, she transferred the property into both of their names. They previously had lived in an apartment at 31 Massachusetts Avenue. In September of 1955, Louise Clark applied for (and subsequently received) permission to convert 440 Marlborough into a lodging house. Rachel Clark died in March of 1961. Louise Clark moved thereafter. On December 16, 1962, 440 Marlborough was acquired from Louise Clark by real estate dealers Stuart H. Hastings and Joseph A. Gautreau, and on February 15, 1963, it was acquired from them by real estate dealer Shirley Clifford Speed. On September 16, 1963, 440 Marlborough was acquired from S. Clifford Speed by Linda J. Wielgus. She married in early 1964 to Alan B. Dolmatch, an engineer. They continued to live at 440 Marlborough until about 1969. On June 18, 1969, 440 Marlborough was acquired from Linda Dolmatch by Lawrence Mezoff and Robert S. Morgan, trustees of the 440 Realty Trust, who made it their home. They previously had lived in an apartment at 31 Commonwealth. Lawrence Mezoff was an advertising and marketing executive, and Robert Morgan was a public health administrator, general director of the Dimock Community Health Center in Roxbury. In July of 1985, Lawrence Mezoff filed for (and subsequently received) permission to legalize the occupancy as a three-family dwelling, which he indicated was the existing condition. On September 30, 1985, they transferred the property to themselves, as tenants in common. Robert Morgan died in January of 1987. On July 15, 1987, 440 Marlborough was purchased from Lawrence Mezoff and the estate of Robert Morgan by Leonard E. Davenport, trustee of the Saxe Nominee Trust. On April 26, 1990, the First American Bank for Savings foreclosed on a mortgage given by Leonard Davenport and sold 440 Marlborough to Paul F. Biron. On June 22, 1992, it was acquired from him by David S. Brody. On June 1, 1994, 440 Marlborough was purchased from David Brody by Robert H. Oppenheim, an artist and professor of art, and his wife, Roberta A. (Levene) Oppenheim. Roberta Oppenheim died in March of 2001. 440 Marlborough remained a three-family dwelling in 2018.